Stuart Semple’s Color War against Anish Kapoor continues well into 2019. Semple’s agenda for this year is to create a 3rd blackest paint that will be an upgrade to the 2nd blackest paint he made, and this time he’s opening the option to be helped by his fans. Since Kapoor started hogging all of Vantablack, Semple has gone and created two black paints to rival the darkness of Vantablack. In February of 2017, Semple released “Better Black,” a pigment that tries to capture the same effects as Vantablack. In March of the same year, he released an improved version called Black 2.0. Though it isn’t as good as Vantablack, Black 2.0 is commercially available to everyone (except Kapoor) and is a whole lot cheaper. Despite the success of Black 2.0, Semple is still trying to create the best black paint in existence by removing the pigment’s reflective quality. 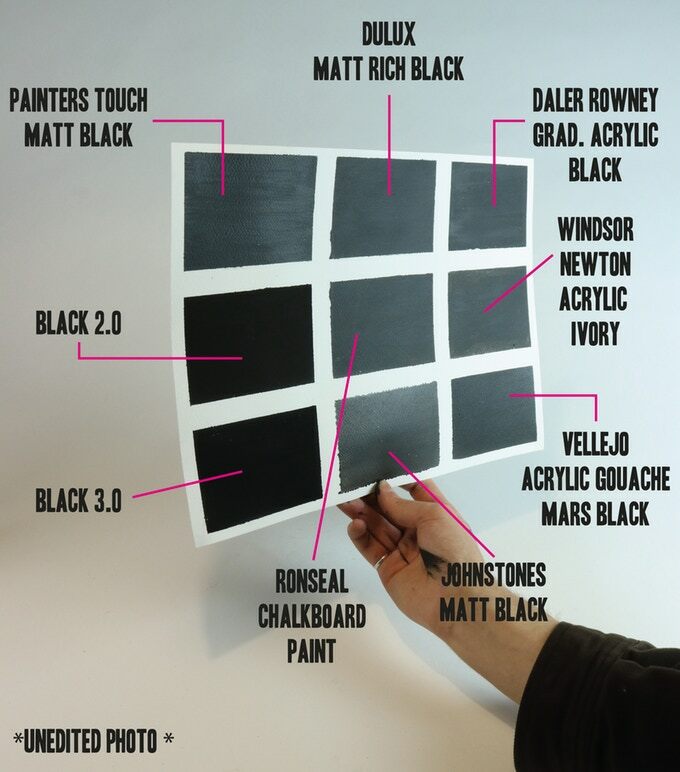 He eventually opened a Kickstarter, that has now been fully funded, to produce the next step called “Black 3.0.” This paint, he claims in his Kickstarter page, is able to absorb 99% of all light that hits it, compared to the 99.96% of Vantablack, can be applied easily like every other paint, and is both non-toxic and washable with water. The Kickstarter was meant for Semple’s studio to be able to move into a bigger factory to produce Black 3.0. He still maintains that the ban on Kapoor is still in effect for Black 3.0. Along with the paint, Semple will also add other merchandise for everyone who pledged to their Kickstarter. For the benefit of those who don’t know, this war started in 2014, when Anish Kapoor obtained the exclusive rights to work with a material called “Vantablack,” a material that absorbs 99.96% of all light that hits it and dissipates it as heat. This means that the material is as black as a black hole, a dead star with gravity so strong that it absorbs light. When an item coated it Vantablack has its picture taken, the object will look like as if someone has painted all over the picture with black. The item will look as if it has no 3rd dimension. Anish Kapoor immediately recognized the artistic potential of the item and with the help of his investors, obtained the right to work with the item for artistic purposes. In addition, it was made so that only Anish Kapoor and his studio is allowed to work with the material. A lot of artists protested this, saying that all artist should be allowed to use the material. And this is when Stuart Semple, who is an artist himself and creates different kinds of pigments and paint, banned Kapoor from buying anything that he created. If you want to buy any pigment from Semple, you must sign a written agreement that you are not Anish Kapoor, or that you have no intention whatsoever of giving the paint to Kapoor. Of course, not everyone agrees to the angry artists’ protests and someone eventually helped Kapoor to obtain one of Semple’s pink pigments in 2016. He dipped his middle finger in it and post it on his Instagram. In response, Semple made a glitter using crushed glass called Diamond Dust, with Semple’s fans posting how Kapoor should try to dip his finger into Diamond Dust next. This also prompted Semple to create Black 2.0. In the Kickstarter, he says that after Kapoor got hold of the pink pigment, he was asked by his fans to just make a black paint that’s just as good as Vantablack. With Semple’s Kickstarter funded, people are now just waiting for him to deliver and produce the Black 3.0 paint. Whether it will have the intended effect on Kapoor remains to be seen. 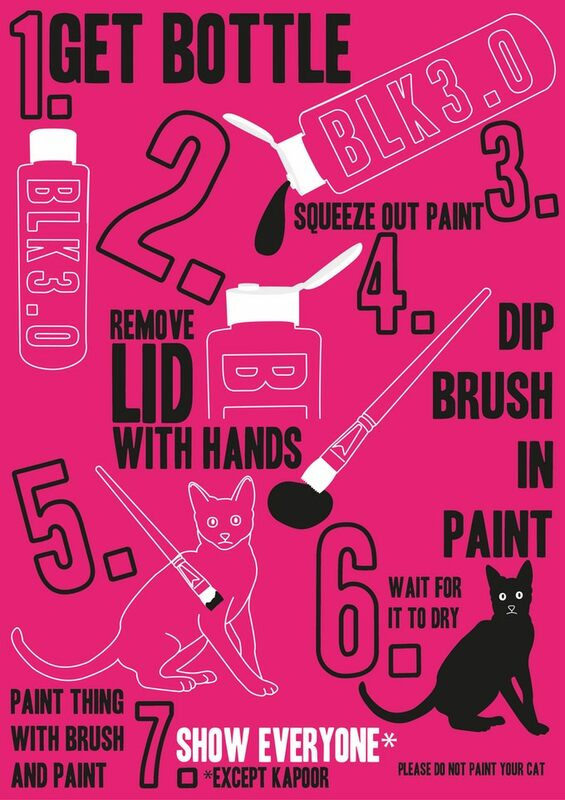 1st Image: The Ad for Black 3.0, via Semple’s Kickstarter. 2nd Image: Black 2.0 and 3.0 compared with other paints, via Semple’s Kickstarter.